Alia Bhatt and Shahid Kapoor launched the first song, 'Gulaabo' from their upcoming rom-com 'Shaandaar', on Thursday (September 10) in Mumbai. 'Shaandaar' couple Alia Bhatt and Shahid Kapoor launched the first song, 'Gulaabo' from their upcoming rom-com film, on Thursday (September 10) in Mumbai. The couple, who will be seen onscreen for the first time together, were an absolute riot as they matched steps on stage and kept the audience entertained. The camera captures Alia and Shahid sharing a cute moment on stage. While Shahid wore a printed tee shirt and denims, Alia was cute as a button in a checked shirt with ILK overalls and metallic sneakers. The duo had some fun with moustache props at the launch. 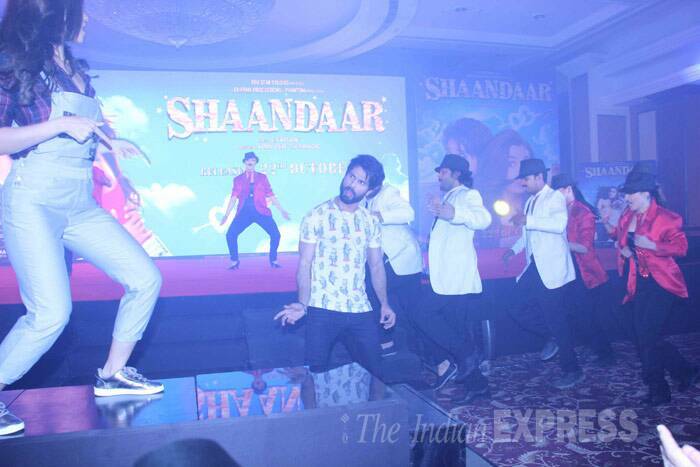 With Shahid Kapoor being quite the star on the floor, there was bound to be song and dance at the launch. Even in the 'Gulaabo' video, Alia Bhatt manages to keep up to Shahid's standard of taking over the dance floor with ease and absolute delight. Alia Bhatt admitted that she was nervous about matching steps with Shahid Kapoor for the song. "Gulaabo was our first ever song that we danced together to. I was damn nervous because I was supposed to be dancing with Shahid. Even with just 10 per cent of his dancing skills, he looks great on stage. So, I had to match up to him. I worked very hard," said the actress. Shahid Kapoor is believed to have helped out co-star Alia in perfecting the dance moves. "At one stage, I even burst out crying and Bosco (choreographer) used to say that I have penguin feet. But I have to say Shahid also helped me a lot," said Alia. It’s a treat watching Shahid and Alia shake to the foot tapping tunes of 'Gulaabo' song. Alia leaves no stone unturned in matching steps with inarguably one of the best dancers in the industry – Shahid, and makes the song her own not just with her moves, but also expressions. In 'Shaandaar', Shahid Kapoor plays the role of a wedding planner, Jagjinder Joginder, while Alia plays Alia. The trailer of the film which went on to become a big hit, also gave us a glimpse of the actress in a bright pink bikini. Choreographer Bosco Caesar and director Vikas Bahl were also present for the song launch. Vikas has apparently planned a better-late-then-never bachelor party for Shahid, since their tight schedule prior to the wedding did not permit the same. The 'Gulaabo' song launch soon turned into a dance party with Bosco singing the lyrics while Shahid Kapoor, Alia Bhatt and director Vikas Bahl danced on stage. Another glimpse into the madness that took place. Check out the sweet expressions. 'Shaandaar' is almost like a family project for Shahid Kapoor as the film also stars his father, Pankaj Kapur and even his half-sister Sanah. "Vikas (Bahl) cast my sister without me knowing it. He met her through Mukesh Chhabra, who was the casting director for the movie. I was shocked when Vikas called me and said that he had cast Sanah as Alia’s sister in the movie. 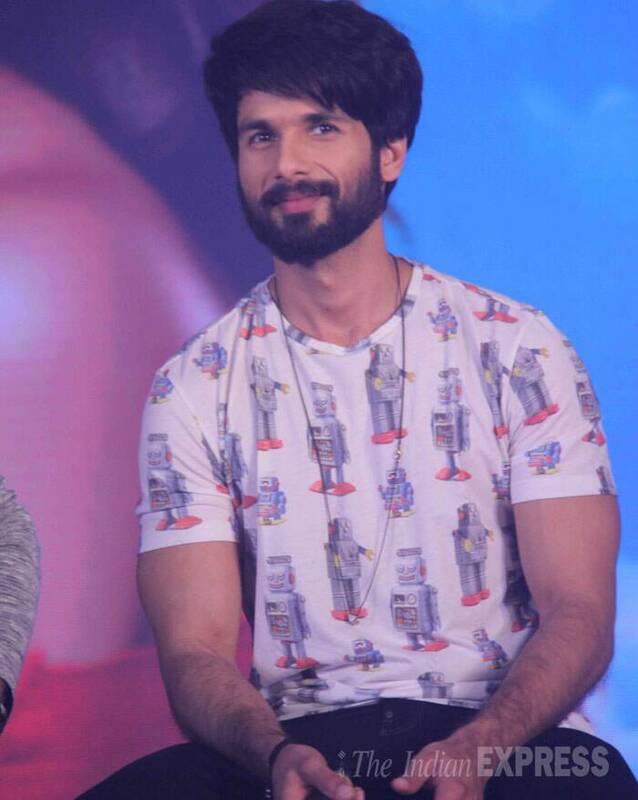 Infact, I think, Alia and Sanah look more like siblings," said Shahid. Shahid and Alia, who are working together for the first time, seem to have struck quite a great camaraderie as they keep posting pictures and updates about the other from the sets. While Shahid is yet to watch 'Shaandaar', wife Mira Rajput has also seen the film, Vikas Bahl showed it to her as a birthday gift. "Vikas gifted her the chance to watch Shaandaar before anyone else. Even I have not seen the movie," said Shahid. Produced by Karan Johar, Anurag Kashyap, Madhu Mantena and Vikramaditya Motwane, Shahid Kapoor and Alia Bhatt's ‘Shaandaar’ will hit screens on October 22.